Nothing huge, but here is a new tweet from Howard Gordon who confirms he is still involved with the 24 movie in some fashion, and that they’re assessing the “best next steps”. @bauermulder24 yes I’ve got a hand in it… but we’re still assessing best next steps. What that means, no one knows for sure, but it seems likely that the script will require some rewrites in order to bring the film in line with the lower budget that 20th Century Fox is demanding. Kiefer and producers Imagine Entertainment were hoping to have a $45-60 million budget for the flick while Fox is persisting on 30 million. There will certainly have to be compromises made somewhere and that is likely what Gordon is referring to. Let’s hope they get this stuff figured out sooner rather than later. Thanks Rob for the heads up. Writers aiming to end 24 series with Season 8? Yeah, it’s extremely frustrating that an iconic series which ran nearly a decade is being treated like it’s some unknown risky new franchise. $45-60m is very cheap for an action flick these days, especially when 20th Century Fox has recently given the newest Die Hard a 100m+ budget and Bruce Willis gets a 25 million salary (compared to the insultingly low 1 million they wanted to pay Kiefer). I am no box office analyst, but a 24 movie seems like it would surely be successful. Die Hard 5 is even a bigger risk than a 24 movie in my opinion. Bruce Willis is a aging action star who’s starring in a franchise that’s on its last legs and yet FOX has no problem with the movie budget of $100m+. That makes absolutely no sense. I agree, it’s completely ridiculous that FOX would want to compromise the integrity of the 24 legacy. Although Howard and Imagine are still confident and optimistic that the script can be reworked while still making a great film version of the series, I think we are less likely to see 24 sequels if the original does not have some huge set-pieces. It pretty much defeats the purpose of expanding the 24 universe if the audience that the movie attracts is smaller. On a different note, I am thrilled to hear that TV by the Numbers is reporting that Touch may or MAY NOT be renewed for a second season. I’m betting the outcome will be cancellation, as numbers have fallen drastically from a 3.9 adults 18-49 rating for its first episode to a 1.9 for its seventh episode. It is worth noting that Touch was also rescheduled to have American Idol as a lead-in, but still hasn’t managed to maintain high viewership. Additionally, there are still six episodes left to air from Touch’s first season, so further decline in ratings will likely occur. I don’t mind Touch myself and the first episode was pretty mind-blowing, and despite Kiefer Sutherland’s awesome presence, the premise got pretty stale pretty fast. Of course not producing a second season of Touch will free-up Kiefer’s schedule much earlier, allowing the 24 movie to move forward quickly. I think we would all rather see the 24 movie sooner than watch anymore Touch!!! 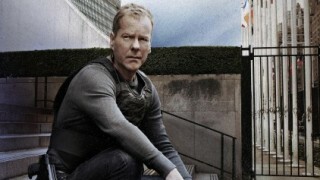 If FOX are wanting the eventual ’24’ movie to underperform at the box-office upon release, their going about it the right way! Having been on television for nine years, ’24’ is going to have to look like a proper MOVIE when it hits cinemas, not only to compete against other big releases, but so as not to look like a bigger-budgeted, theatrically-released version of ‘…Redemption’, people need to look at the ’24’ movie and say “wow!” in comparison to the series (given a bigger budget and longer production time), it needs to differentiate itself from the series look-wise, and actually look like it wasn’t a spin-off from television, and that isn’t possible with a mere $30million, I second the above comment about FOX showing some leeway on the budget and upping it to at least $40million, if not just give Imagine the whole $45million they’re looking for… or risk ’24’ sinking at the box-office and tarnishing it’s legacy because the studio were unreasonably tight with the money!